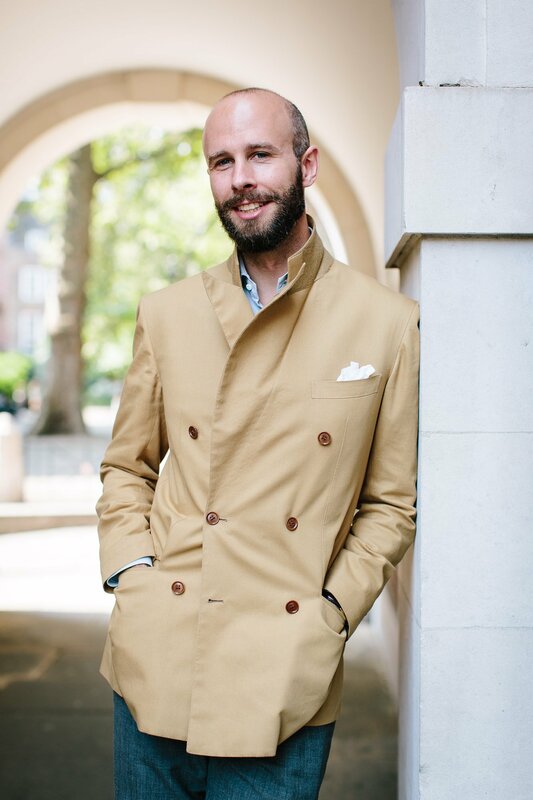 This is my final cotton jacket from Ferdinando Caraceni - which fortunately I received a few weeks ago and was therefore able to wear a fair bit before the weather turned. It is obvious even now that this is a piece that will wear in beautifully. 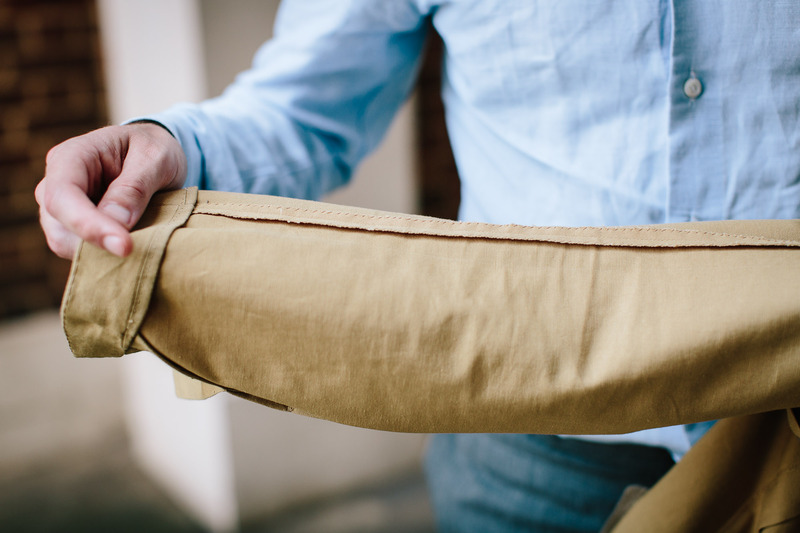 As mentioned in my first post on this jacket, the heavier, less finished cotton wears more like denim or old-fashioned chinos, feathering and losing colour around the seams. In fact, that's one reason I think I'll wear it even into the autumn, likely with a thin crewneck sweater underneath. It's just so incredibly comfortable, despite its fairly formal cut. That cut and the colour does make it fairly limited in terms of what it can be worn with. Only formal trousers below the waist, and in my experience so far those largely in shades of grey. Interestingly, the square shoulder line of a classic Milanese jacket (see my first, herringbone cashmere jacket from Caraceni) is softened a little here by the sleevehead. The sleeve is inserted underneath the shoulder like the Neapolitan spalla camicia, giving it slightly more casual look. 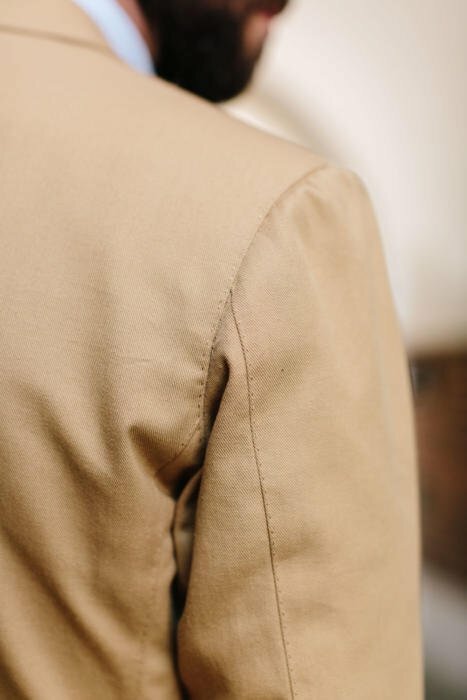 (That shoulder line also emphasised by the pick stitching that runs along pretty much every seam on this jacket - as seen above). 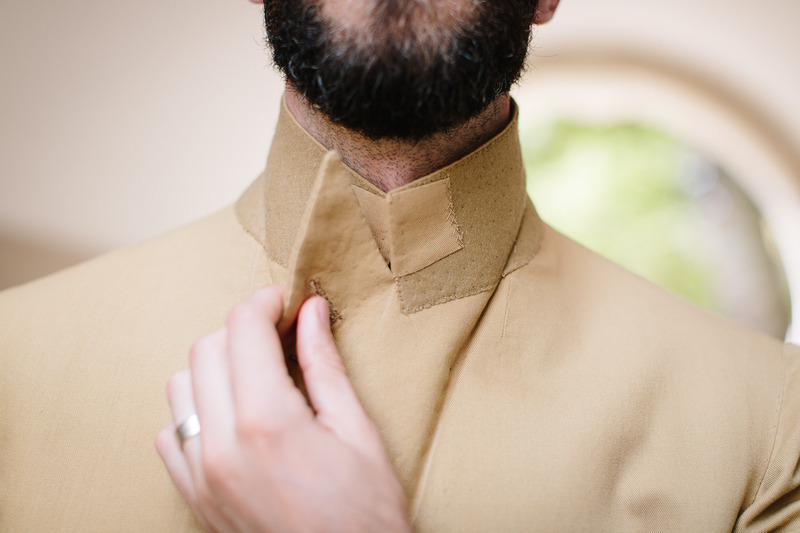 However, the shoulder pad is extended out into the top of the sleevehead, like a normal Milanese jacket and unlike the Neapolitan, which lengthens the shoulder and pushes it towards the formal. As a reader pointed out on my DB-comparison post, the lapels are quite old-fashioned - wide, with a decent belly, and a fairly flat gorge. 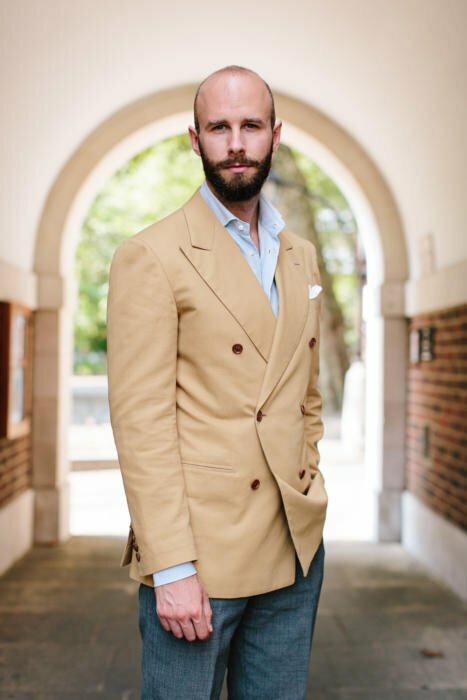 One advantage of this flat gorge (where the collar and the lapel meet) is that the peak lapels fold neatly either side of the chin when the collar is popped up (as above). Wearing the collar up will be disliked by many, but it does work well with the soft lapels, and again would be nice with a crewneck sweater or scarf underneath. The fit is superb, as I would expect with Caraceni, though of course the cotton doesn't drape anything like wool would. And the make is just beautiful, with that pick stitching running everywhere, outside and in. Below the sleeve has been turned inside out to see the unlined finishing. I'm not one to push up or fold back the sleeves of a cotton jacket, but it is the kind of make that would make that style very easy. Finally, I was surprised how much I liked the mid-brown corozo buttons. I would nearly always go with horn, but this paler shade of corozo reveals more of the whorled pattern and sits nicely with the cotton. I can't wait to wear it more. Oh, and the sleeves are not too short; the shirt is a touch too long. You can follow the discussion on Ferdinando Caraceni double-breasted cotton jacket by entering your email address in the box below. You will then receive an email every time a new comment is added. These will also contain a link to a page where you can stop the alerts, and remove all of your related data from the site. Very nice jacket. Who made your shirt and trousers please? The fresco I’ve seen in the past has all been a single/solid colour. The image on the travel jacket makes it look less interesting than this page but still more shades mixed into the fabric than Ive seen in person before so probably 50/50 between the fabric and compression making them looking good here. Excellent jacket,Simon.Beautiful pick stitching.A casual and elegant piece. Hi Simon. Great jacket. How does the fit and finish compare with your Caliendo DB? Is it a fair comparison ? The line along the top of the peak lapel is a little flatter than on other DBs. It’s more obvious on the post comparing five DB styles, including this one. Lovely, jacket. How do you take care of your cotton trousers? I had a few pairs made and after shrinking and discolouring one pair (despite being advised by the tailor to do this), I’m loathe to risk it again. What did you do to shrink and discolour them? Could this have been another candidate for a three-way suit? It seems to me that this cotton would also make a lovely pair of odd trousers. In fact, I could imagine a nice outfit that’s effectively what you have here but “upside down”: trousers in that cotton and a grey jacket, maybe in that H&S cashmere donegal that you have earmarked. Good point, and yes it could well have made a nice three-way suit. The nut buttons look lovely, but I can’t understand what is happening around the back/armpit photo as it looks a bit messy, and perhaps the coat is a touch short on you? Ignore the fit in the image – I’m turning to camera to get the detail shot. Simon, just out of curiosity, why wouldn’t dark brown trousers work with this jacket? Dark blue or bottle green would work very well indeed. Interesting comment about popping collars on a jacket. I like the look but often back away from it, worrying that it looks too effete. I’ll try it with a crew neck and scarf. I really like the look of this coat but cannot help wondering if it isn’t a bit on the short side? Slightly longer would certainly compensate the hollow in the small of your back and add some balance to your arms. Love everything about this jacket Simon. A fabulous piece. Would you wear with dark olive green trousers or only formal grey? I found dark olive didn’t quite work, but again so much depends on the shade. Wonderful looking jacket Simon. Have you ever considered expanding PS into a YouTube channel? Would be fascinating to see your commissions in 3D and get a sense of how the tailoring moves around as it’s worn. Indeed the jacket looks better than in the 5 DBs article’s pic: the edges pointing towards the sleeve-heads while one here barely sees that the gorge is (too) low. Nice pic. I do find it is not obvious to spot that the padding continues underneath the sleeve head. Any idea as too how much this bespoke jacket would cost? 4200 euros @ 1.157 dollars per euro is $4,859.40 gringo dollars. 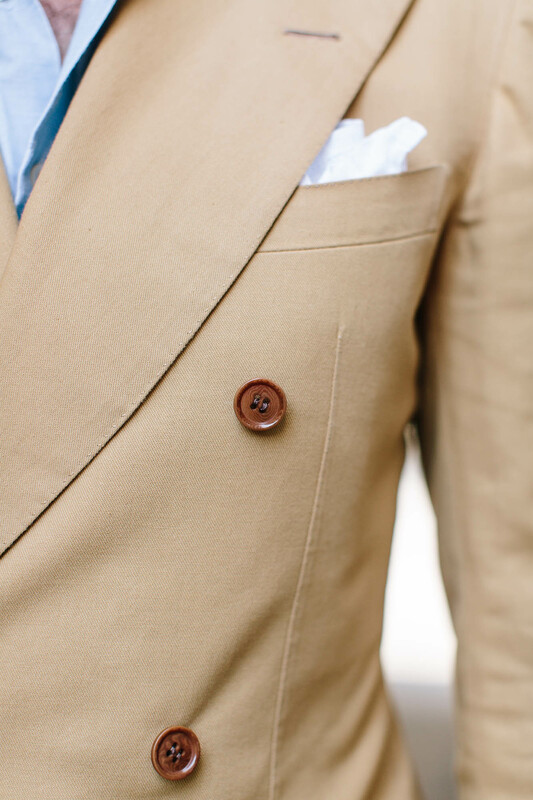 There seems to be a really wide spread between “skinny lapel” blazers and bespoke items. One would think that there is a void to be filled with “in between” ready made wear. I’ve been looking for quite some time for a size 46 ready made linen blazer, lapels 4-1/4″ tp 4-1/2″ temps go to 110 Fahrenheit where I live) to no avail. Most sizes are from 38 to 42. Would appreciate it if I could hear of one available. I’m 6’3″, 220 pounds. Current sizing of one size ranges from “slim fit”, “modern fit”, “classic fit”, IT sizing (loose and regular) and whatever else. I can understand why you prefer to wear more formal trousers with this jacket,Simon,but I think a pair of linen or cotton trousers in a different shade to the coat may also work well. The jacket looks beautiful. Who is the manufacturer of the fabric and what is swatch number? Have you tried it with denim? My impression is that it would work but maybe to much contrast between the jacket’s formal cut and the casual jeans. How about charcoal trousers? Yes, you’re right the colour’s nice but the cut would be too formal. Lovely jacket, I prefer the 4 button look myself. Surprised to see you with your hands in your pockets I think that can ruin the cut of the jacket as the pockets can then bulge. It’s not as precise, but it certainly doesn’t ruin the cut of the jacket – having it undone will do that far more, as you lose all fit through the waist. With hands in pockets but buttoned you still have that fit and cut. Also as mentioned previously, the biggest challenge with a DB jacket like this is toning down the formality and stuffiness. Using the pockets is an easy, casual way to do that. Many thanks for this informative review! 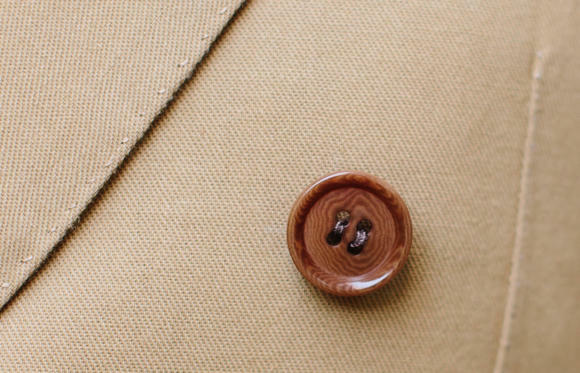 I was looking for heavier weight, coarse cotton cloths for a casual cotton suit – do you think this would do?